Watch a live video stream as Brian broadcasts his Peabody Award-winning show from The Greene Space. Live From Here From The Greene Space! Host of Live From Here (and mandolinist) Chris Thile stops by to talk shop and play songs. A companion album for 'A Prairie Home.' A former New Yorker on what she loves about returning to the city. How Chris Thile Built An Album Out Of "A Prairie Home Companion"
Singer, musician and songwriter Chris Thile discusses his new gig: hosting "A Prairie Home Companion." In this episode: Nickel Creek wowed audiences when they burst onto the scene in the early '90s. A trio of precocious child prodigies -- Chris Thile on mandolin and banjo, Sara Watkins on fiddle, and her brother Sean Watkins on guitar -- Nickel Creek boasted adventurous songs that melded elements of progressive bluegrass and country, classical and jazz, traditional roots and rock, performed with ecstatic virtuosity and youthful liveliness. After eight years apart, the group recently reunited; we hear some of their new songs. Plus: Caffè Lena is one of the most influential folk music venues you've never heard of. Lena Spencer opened the cafè in 1960 and the Saratoga stage has been hosting some of the best folk musicians around ever since -- from Hedy West and Arlo Guthrie to Don McLean and Bob Dylan. In an interview with Soundcheck host John Schaefer, Jocelyn Arem -- the director of the Caffè Lena History Project -- talks about the new book and album about the venue and its history. This is an encore episode of Soundcheck. In this episode: In his new book, The Bee Gees: The Biography, writer David N. Meyer looks back at the music and legacy of The Bee Gees and its trademark soaring falsetto. Actress and soprano Audra McDonald recently starred in Broadway's revival of Porgy and Bess. Now, she's back with her first solo album in seven years, Go Back Home, featuring songs by Rodgers and Hammerstein and Stephen Sondheim, among others. McDonald performs songs from that album in the studio. And mandolin extraordinaire Chris Thile performs the sonatas of Bach. Hear mandolin extraordinaire Chris Thile perform in the Soundcheck studio. In this episode: We hear about the “New Hot Jazz” movement: young musicians and singers playing the jazz of New Orleans and the 1920s. 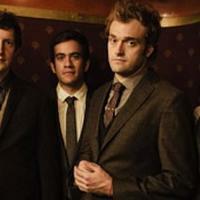 Plus: Mandolin player Chris Thile goes back to Bach on his new album. He plays live. And: There’s a new trend in country music: the remix. We listen to some of the results when traditional country adds a dancefloor beat. Punch Brothers just aren’t as young as they used to be – but that’s not saying much, considering that frontman Chris Thile recorded his first album as an 11-year-old with bluegrass band Nickel Creek. However, on Punch Brothers’ latest record, “Who’s Feeling Young Now?,” the five-piece band (now all in their mid-20s to early-30s) seems more energetic than ever. The group brings their rollicking string-band rock to the Greene Space for a live performance. Cellist Yo-Yo Ma, bassist Edgar Meyer, mandolinist Chris Thile and fiddle player Stuart Duncan have come together for an album called “The Goat Rodeo Sessions.” This all-star team joins us to perform in our studio – and to explain what the heck a goat rodeo is. Mandolin virtuoso Chris Thile’s musical collaborations have taken varied shapes over the years, from Nickel Creek’s trio to the Punch Brothers’ sextet. But one of his latest projects is a two-sided venture with Brooklyn-based guitarist Michael Daves. The duo released an album, “Sleep with One Eye Open,” earlier this year, and joined us live in The Greene Space to regale the audience with their urban-infused bluegrass. Mandolin virtuoso Chris Thile’s musical collaborations have taken varied shapes over the years, from Nickel Creek’s trio to the Punch Brothers’ sextet. But his newest project is a two-sided venture with Brooklyn-based guitarist Michael Daves. The duo released an album, “Sleep with One Eye Open,” earlier this year, and join us live in The Greene Space to regale the audience with their urban-infused bluegrass. Soundcheck is celebrating musical collaborations in The Greene Space with mandolin virtuoso Chris Thile of Nickel Creek and guitarist Michael Daves, and bluegrass legend Del McCoury and the swing kings of the Preservation Hall Jazz Band.